Investing in Asia Pacific countries can be done through mutual fund. Mutual Fund is ideal for instant asset diversification. 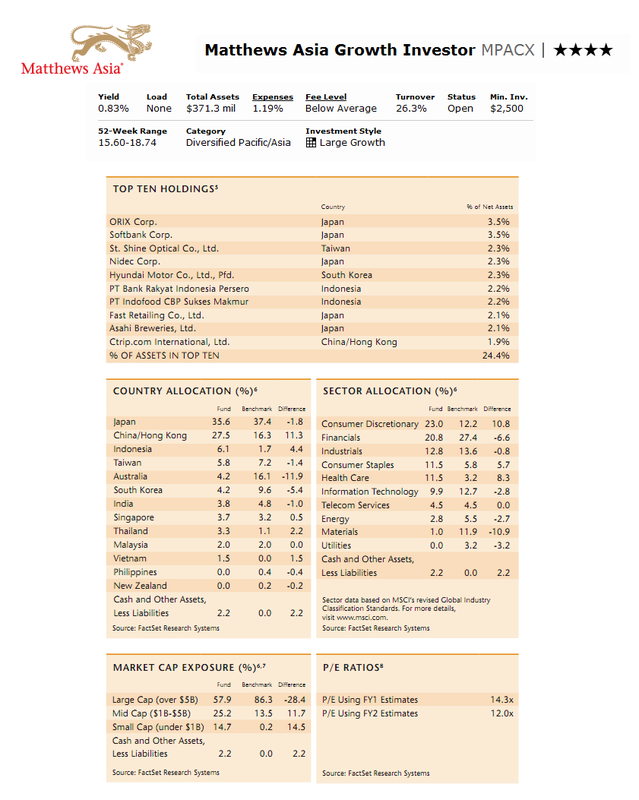 One of the best rated diversified Pacific/ Asia International stock funds is Matthew Asia Pacific Investor fund. Details about the fund's review is as follow. The Matthews Asia Pacific Investor investment seeks long-term capital appreciation. The fund typically invests majority of net assets (>80%) in the common and preferred stocks of Asia pacific region companies. This Matthews fund may also invest in the convertible securities with any duration or quality of Asia Pacific companies. Taizo Ishida has been managing this top Asia stock fund since January 2007. He is assisted by Sharat Shroff as Co-Manager. The expense ratio is a bit lower (1.19%) compared to the average in the category (1.59%). As no load fund, there is no sales load for purchasing this MPACX fund. It also has a dividend yield of 0.85% per year. The total net assets are $351 million. Since its inception in 2003, this Matthews Asia Pacific fund has experienced 6 years positive return and 1 year negative return. The best achievement in 1-year total return was achieved in 2009 (44.81%) whereas the worst performance was in 2008 (-37.44%). The MAPCX fund has 4-stars rating from Morningstar. 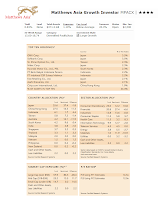 As June 2011, the year-to-date return is 0.78% and the 5-year average return is 8.14%. This MAPCX fund has returned 25.12% over the past one year and 11.03% over the past three years. The other class available for this fund is Institutional Class (MIAPX). The CUSIP of this MIAPX fund is 577130776. This MIAPX is a new fund as it was introduced to public in October 2010. The minimum balance to invest in this best international stock fund is $2,500 for brokerage account and $500 for IRA account. A minimum of $100 is needed for the subsequent investment of brokerage account. This fund uses MSCI AC Asia Pacific Index as its benchmark. MPACX can be purchased from 83 brokerages, include Merrill Lynch, JP Morgan, T Rowe Price, Schwab Retail, Fidelity Retails Funds Network, E Trade Financial, Vanguard NTF, Dreyfus NTF, Ameritas NTF, etc. The top 10 holdings as of this best mutual fund as of June 2011 are ORIX Corp (3.5%), Softbank Corp (3.5%), St. Shine Optical Co Ltd (2.3%), Nidec Corp (2.3%), Hyundai Motor Co Ltd Pfd (2.3%), PT Bank Rakyat Indonesia Persero (2.2%), PT Indofood CBP Sukses Makmur (2.2%), Fast Retailing Co Ltd (2.1%), Asahi Breweries Ltd (2.1%), and Ctrip.com International Ltd (1.9%). The top countries allocations are Japan (35.6%), China/ Hong Kong (27.5%), Indonesia (6.1%), Taiwan (5.8%), South Korea (4.2%) and Australia (4.2%). Principal Risks of Investment of this Matthews fund include Political, Social & Economic Risks, Currency Risks, Risks Associated with Emerging Markets, Trading Markets and Depositary Receipts, Volatility risk, and, Convertible Securities. More details can be found in the fund’s prospectus.